Samsung Electronics Co. is bathing in the glory of forgiveness. The latest tidbit has its Galaxy S8 smartphone hitting 1 million unit sales in South Korea since its April 21 release, twice as quickly as the previous S7 and S6 models, Yonhap News reported. 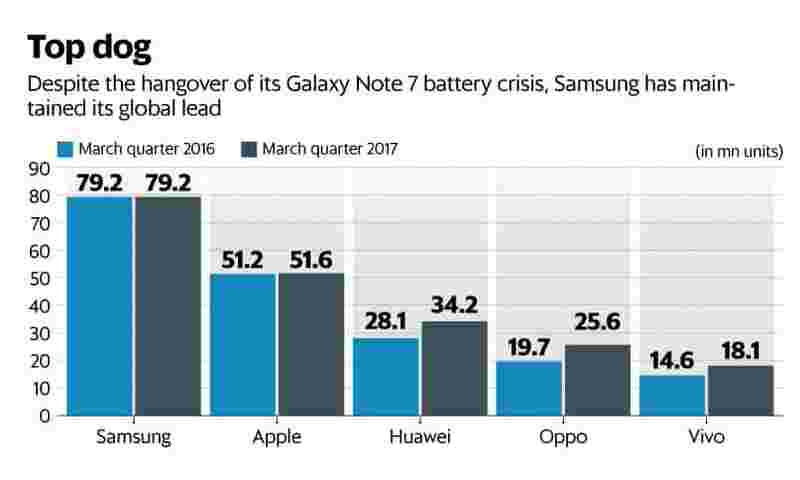 Admittedly, that is Samsung’s home market, so you’d expect its compatriots to return to the brand more readily than elsewhere after last year’s battery disaster. But a doubling of the sales pace is quite a feat. It adds to the growing news flow suggesting Samsung is recovering well, with consumers lured by its cool bezel-less design and whizzbang features. But I’d posit an alternative reason: habit. While there are dozens of smartphone makers globally, only Samsung has the geographical reach to make it the default Android option almost everywhere. 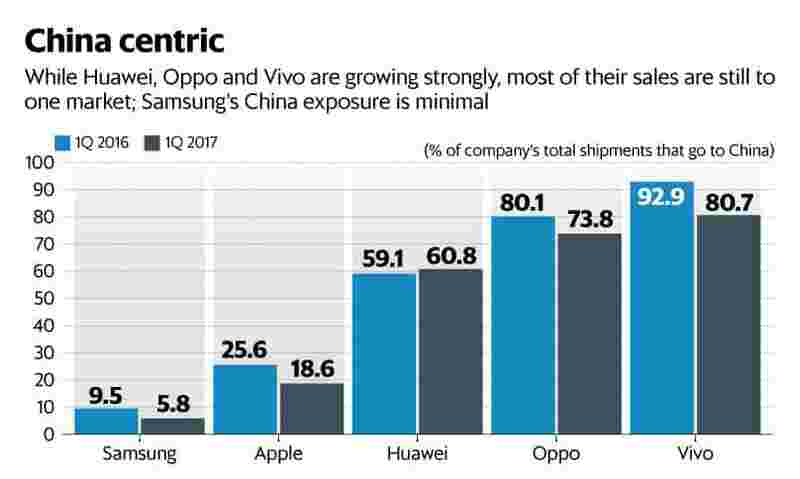 Much has been said about the rise of Chinese brands such as Huawei, Oppo, and Vivo. Yet those three combined don’t equal the shipment volumes of Samsung. More significantly, each of them barely exists outside their home market. Even Huawei, a global brand in its own right, sells 61 percent of its devices within China, according to data from Bloomberg Intelligence and IDC. For all manner of political and nationalistic reasons, Chinese prefer not to buy Samsung phones. Many other countries also have local heroes that patriots turn to. But that hasn’t stopped the world, in general, from choosing Samsung. Latin America consistently gives it a 30 percent share while Asia ex-Japan remains loyal quarter after quarter. It’s still No. 1 in central and eastern Europe, despite a strong advance from Huawei, and in western Europe, Samsung is second behind only Apple Inc.
With not much difference between Android models, and most consumers just wanting a good, reliable device, Samsung has become the default brand. This was put in jeopardy with the Galaxy Note 7 debacle, but that crisis is over. Forgiveness is a wonderful thing, though in reality what Samsung may be enjoying is the power of habit. Tim Culpan is a technology columnist for Bloomberg Gadfly. He previously covered technology for Bloomberg News.